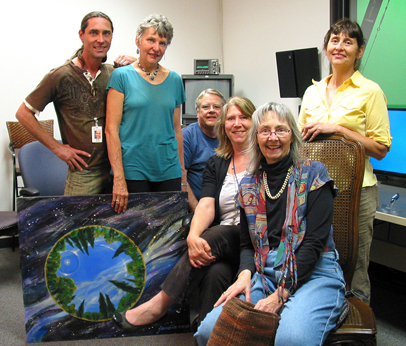 Cast and crew at the Nevada City TV studio. Left to right: Syris Metara, Janaia Donaldson, Jay Kuca, Terri Hicklin, Ivey Cone, Terra Nyssa. You asked for it! After we had our Connect the Dots: Systems in Collapse video panel discussion, some Peak Moment TV viewers asked to hear more of my perspectives. Host and producer Ivey Cone said sure, so she and I did Take Two. Ivey and I got on a roll in Living with the Predicament. We were just picking up threads from our ongoing years-long conversation about the collapse of industrial civilization. This is not a problem. A problem can be solved. This is a predicament. We can’t solve our way out of this one, with technology or any other mythic fix. It’s something we have to live with. Peak Oil (now a reality) is part of the predicament. Non-renewable resource declines are part of the predicament. And of course the corker in this predicament is runaway climate change. How do you respond to a predicament of this magnitude? Ivey and I barely scratched the surface. Start by feeling what you feel about (essential but hard in a culture that prefers denial and delusion). Disengage from the system where you can—grow food, buy local, get out of debt. Live fully each day. 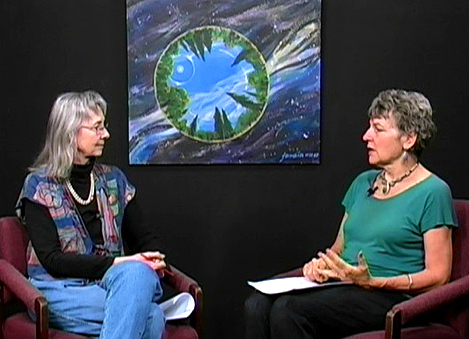 Cultivate generosity and gratitude, like the awe inspiring my painting “We Live Here” (between us on the set). We are all the target so wear bright colors and dance with those you love. Falling in love has always been a bit too much to apply to one person. Falling in love is appropriate now, to love all these things which are about to leave. The rocks are watching, and the squirrels and the stars and the tired people in the street. If you love them, let them know, with grace and non-invasive extravagance. Care about the beings you care about in gorgeous and surprising ways. Practice random kindness and senseless acts of beauty. This is your last chance. What an incredible opportunity this is—a sheer wonder to be alive at this unprecedented moment in all of human history. And to be expressions of the universe becoming aware of itself. Great job, Ivey and Janaia. We have spent lots of time on your back porch talking about the Predicament.